Crime Watch: Can new TV series like Neil Cross's Luther be saviours for British crime drama? Can new TV series like Neil Cross's Luther be saviours for British crime drama? There was a very interesting article in The Independent on Friday, looking at a 'new wave' of modern crime-based television shows, and whether they could regenerate a popular but perhaps tired genre in Britain, that had lost its originality and "creative gumption" in the 20 years since the heyday of Prime Suspect and Cracker (interestingly, both shows that Lee Child was involved with during his former days at the BBC). Gerard Gilbert says the arrival of a number of new shows, spearheaded by Luther (created by Wellington based screenwriter and author Neil Cross), is not a moment too soon, with "these brave new dramas" giving British television a chance to catch up with the richness and complexity of its US equivalent. "British crime is long past the hour when it needed to freshen up and take notice of the genre-bending and deepening that's been happening across the Atlantic with shows like Dexter, The Shield, Southland and The Wire," says Gilbert. Luther starts its run on BBC1 this coming week, on Tuesday 4 May. Neil Cross features heavily in Gilbert's excellent article (although there is a mistep early on when Gilbert calls Cross a 'debutant screenwriter', apparently overlooking the New Zealand resident author's key role as lead writer in recent seasons of Spooks), and I am excited to see what the master of dark and twisted tales packed with moral dilemmas has in store for us with Luther. "What's really different with this show," explains Luther leading man Idris Elba (who played Russell 'Stringer' Bell in The Wire), is that Luther is not a whodunnit. "In each episode the audience discover early on who the murderer is, so the drama is not in the mystery – it's in watching Luther work out how to catch the killer." Cross also had some very interesting things to say about the traditional 'puzzle mystery' of the Conan Doyle, Christie, and Ngaio Marsh side of the crime writing canon, and the future of crime writing. The entire article is well worth a look - you can read "Viewers face a very different crime wave as a new set of police heroes hits the small screen" in full here. Are you excited by the new wave of British crime dramas? Do you like the 'modern' American crime shows like The Wire, Breaking Bad, The Shield, and Dexter? Or do you prefer the traditions of Inspector Morse and Midsomer Murders? Or both? Thoughts and comments welcome. 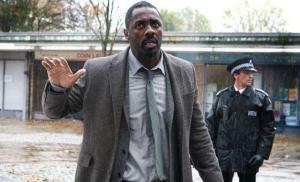 I am sure Luther will be pretty good as Idris was superb in The Wire and in the Number One Ladies detective Agency. The Wire and Morse are in a class of their own compared with the others you mentioned, although Dexter started well and then deteriorated. That concept--the audience learning who the murderer is early on--isn't exactly new for viewers who remember _Columbo_ from several decades ago. The interest was in watching Columbo slowly close in on the murderer. new or innovative. I was also unhappy about the subtle putdowns of other shows. When it's necessary to pump up one's own show by knocking others, I wonder about the quality of that show. However, that's marketing and has little to do with the quality of the show. So, when the shows get on DVD I'll try them out. Frankly, the most exciting part of the article was the announcement near the end that Peter Robinson's DCI Banks is finally appearing on the small screen.